You know what the thing about Scarface is? If you ask a woman what she thinks of it, she'd talk normally about it. If you asked a man, though, he would most probably go on for hours about how awesome the film is, quoting it as he goes along-"Did you see how he killed Manny? Man that was awesome! Cockaroach! Cockaroach!" etc. This is not simply because Scarface is an amazing film. It has more to do with the main character, Tony Montana. EVERY man, to some extent, wants to be Tony Montana. I want to be Tony Montana. You want to be Tony Montana. If you are male. Don't lie-you're probably practicing your evil Cuban druglord smurk right now. Back to the matter at hand, it seems that now we can carry a bit of Montana around, with the release of Scarface: Money. Power. Respect for the PSP. Said game, however, is of the strategy genre, and all people really want to do is play through the film. And use the chainsaw. 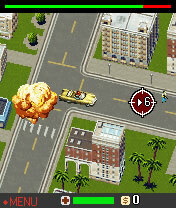 So, the mobile version of Scarface, Scarface: Rise of Tony Montana, promises to deliver an action-oriented experience. 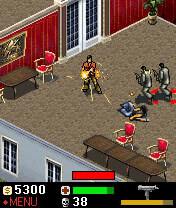 Scarface: Rise of Tony Montana, developed by G5 mobile, is unlike the console and PSP version because, instead of creating its own storyline set after the film, it simply follows the events of the movie. As Tony Montana, you'll collect drug money, work with Omar and the gang, drive around town with Manny, meet Frank, betray Frank, marry Elvira and much, much more, through around 12 levels. For people who haven't seen the film, Tony Montana travels to America as a Cuban immigrant in pursuit of the American dream. The graphics in Scarface aren't amazing so to speak, but they certainly get the job done- in not going overboard with the graphics, the game runs smoothly throughout, with no pauses in animation. That being said, a lot of colors have been included here, especially in the street levels. Tony's also wearing his trademark red shirt in the game, whose detail can be seen clearly. I was also quite surprised to here the eerie ambient music from the film when I booted up the game-very impressive. You can also hear shotgun and machine gun fire, engine sounds, people getting run over, and coins hitting each other when you win at blackjack. The game itself combines three gameplay modes- a standard action mode, where you simply kill a lot of people with a lot weapons, a driving mode, where you partially control a car and carry out various errands around town, and a blackjack minigame, which is rather self explanatory. The shooting levels are generally quite fun, allowing you to use chainsaws, shotguns, uzis and, later in the game, the famous grenade launcher-equipped assault rifle. The driving levels are quite frankly half as fun as fun as they should be- instead of having complete control of the car, all you can do is press a key when the corresponding number appears on the screen, which is quite boring. The blackjack minigame is quite fun, but appears too little in the game. You get ranks based on your performance in each level, from cockaroach to kingpin. Finally, fans will be pleased to hear that the game features a huge amount of lines from the film, Including Tony's final speech. Overall, Scarface: Rise of Tony Montana puts a lot of effort into trying not to be mediocre, like most movie-licensed games on mobile are. I was rather impressed by how faithful the game stayed to the events of the movie, as well as some of the music. This is definitely worth playing as a sort of prologue to the console and PSP games. What's Hot: Stays faithful to events of the film, real film phrases, Tony Montana, quite a lot to play through. What's Not: Not enough 80's music, average graphics.